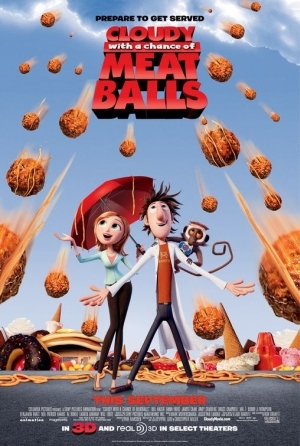 Based on a popular children’s book, Cloudy with a Chance of Meatballs tells the story of Flint Lockwood, a young inventor who keeps trying to make life better for people in his small island town of Swallow Falls. His inventions always backfire, including the titular invention that makes the sky rain food. In the sequel, which I watched this past weekend because shut up I enjoyed the first one leave me alone, we learn that some of the food has become sentient. Swallow Falls is now home to a unique ecosystem that includes watermel-ephants, taco-diles, fla-mangos, and many other hybrids called foodimals. In addition to featuring some of the best puns I’ve ever seen, these movies also raise some interesting questions about ecology, sustainability and conservation. The reason that Flint tries to invent something that can create any kind of food is because his town has fallen on hard times. Their economy is mostly based on sardine fishing, and the global market collapses because “everyone realized that sardines are gross.” This brings to mind the true story of the collapse of the Newfoundland cod fishery. The rich cod stocks were a major reason for early European settlement of North America, and until we overfished them, they supported vibrant fishing communities for centuries. The Canadian government placed a moratorium on cod fishing in 1992, and stocks still haven’t recovered. Unlike cod, most stocks of sardines are not overfished. It’s a shame that people (in reality and in the movie) think they’re gross, because many low trophic level fish like sardines can be extremely sustainable when consumed directly. Also, I suppose that the ability to create any kind of food out of thin air would eliminate most of the environmental concerns associated with food production, including the sustainability of wild harvested food and the destruction of threatened habitats to create agricultural land. So that’d be a good thing. The discovery of the foodimals in the sequel starts an important debate among the movie characters. Some foodimals are believed to represent a dangerous threat to humans, and therefore some people believe they should all be destroyed. I can’t imagine any real-life situation analogous to this, nope, nothing at all. Others point out that these creatures are unique, only found on the isolated island of Swallow Falls, and therefore should be conserved. The scientific term for a species like this is “endemic,” and many real-life isolated islands like the Galapagos or the Hawaiian islands are home to many endemic species. In fact, Swallow Falls probably had some endemic species before the non-native foodimals took over the ecosystem and displaced them. Movie characters were concerned about the foodimals escaping their native range of Swallow Falls because they might threaten humans elsewhere, but many plant and animal species around the world are threatened by non-native species, known as invasives, taking over their habitat. One of the most famous examples of this in the ocean conservation world is the lionfish invasion. These fish are native to the Indo-Pacific, but after being released into the Caribbean about 20 years ago, they’ve spread from Massachusetts to Venezuela. Like many invasives, lionfish both eat native fishes and outcompete native fishes for the limited food resources available. The foodimals took over the Swallow Falls ecosystem in just over six months, and I shudder to think what they’d do if released onto the mainland. So, from a conservation perspective, would the foodimals be treated as an endangered endemic species native to Swallow Falls that we need to conserve, or as a harmful invasive species that is a threat to Swallow Falls other native endemics? Would the town of Swallow Falls be able to keep their sardine fishery in business if they marketed it as a sustainable, eco-friendly food choice? Why were most of the foodimals vegetables combined with animals, but shrimp-anzees are an animal combined with another animal?